Around every corner, U.S. history is alive in Vicksburg. This “Queen City of the Bluff” offers plenty of opportunities to take a step back in time. Civil war battlefields, century old churches, cotton fields, and restored train depots are just a few of the many intriguing landmarks that await your visit. Marvel in the beautiful antebellum-style homes and watch Vicksburg’s history come to life at the riverfront murals. Become acquainted to the Houmas House and its history as well as its 38 acres of gardens, ponds and a majestic live oak alley during this port stop. Make sure to explore the southern splendor of "The Sugar Palace" through 16 rooms filled with period antiques and Louisiana artwork. Welcome back to New Orleans, commonly referred to as the Birthplace of Jazz. There is something for everyone with this city’s history, culture and arts prevalent around every corner. The open air artist colony proudly displays local artist’s works on the iron fence in Jackson Square, while the city’s 45 museums carefully preserve the city’s rich history. Stay an extra day or even a few nights to enjoy this lively city. Board one of our brand new riverboats, as we celebrate the music, history, and culture of the Lower Mississippi. 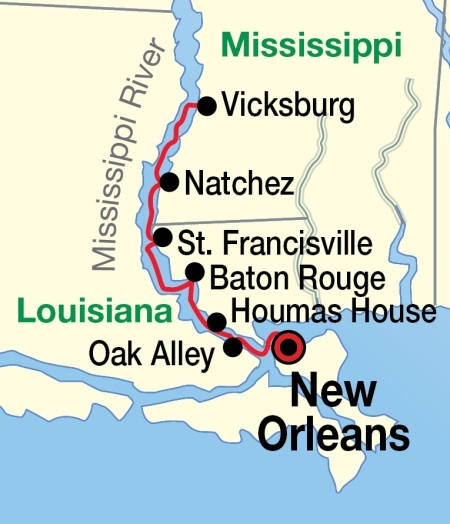 Your journey begins and ends in New Orleans, a melting pot of French, African, and American culture. Here you can enjoy exclusive access to its vibrant music scene and the best in Cajun and Creole cuisine. On our curated tours of area plantations such as the Oak Alley, Frogmore, and Rosedown, hear stories about southern life from a team of passionate experts who we have assembled to show you each place in detail. Explore historic towns and beautiful gardens along the way and be treated to an exclusive American Cruise Lines classical piano concert at the famous J.N. Stone House. In Vicksburg, our expert guides show you the battlefields, the USS Cairo, and the most significant historic sites throughout the city.